We visited the Eumundi markets in the Sunshine Coast hinterland (about 20 km's west of Noosa) in the beginning of December. We were already at Twin Waters, so it wasn't too much further on from Brisbane. It was very wet to begin with; then cleared as the day went on; and finally it got wet again as we were leaving in the afternoon. The rain kept the usual crowds away — good for us, bad for the sellers. I'm not usually a big fan of markets as most of them seem identical to me. This one is one of the better efforts, despite the rain. 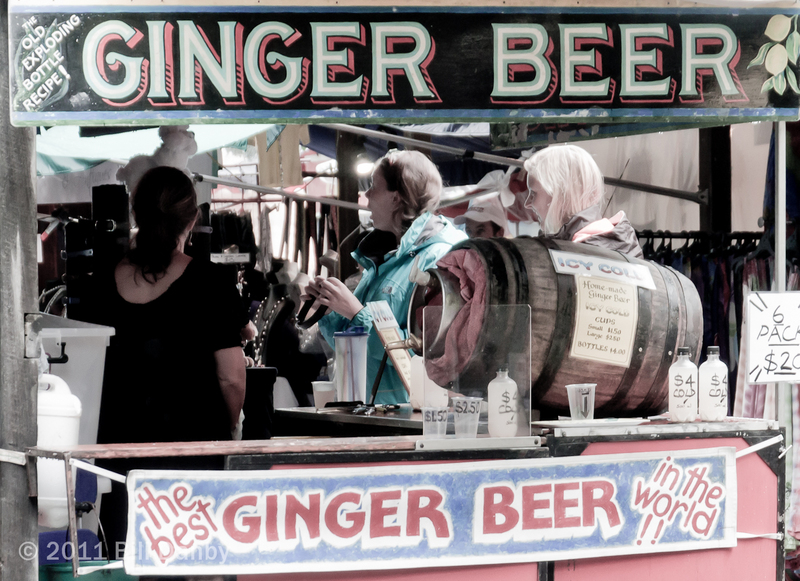 I particularly liked the the idea of the"exploding bottle" ginger beer recipe (see the upper-left advice), and also the modest claim of "the Best Ginger Beer in the World," but not enough to try it.